Patio Furniture are chairs, tables, umbrellas, lounge chairs, etc. that are designed to be used outside. 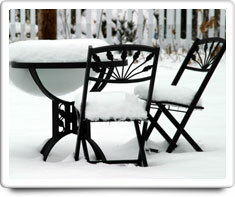 Patio Furniture may be made from materials such as: soft wood; hardwood; metal; wicker; or plastic. If you live in a climate where the winter months are cold or rainy, you should bring in or cover your outdoor furniture for the winter. Decking and Lawn & Landscaping. Shown in the 'Routine Care' section are the recommended routine maintenance tasks for your patio furniture. The 'Q & A' section shows answers to common questions. And the 'Articles' section provides helpful articles about your patio furniture.